Frizzlefry Blog: Work... how it should be. 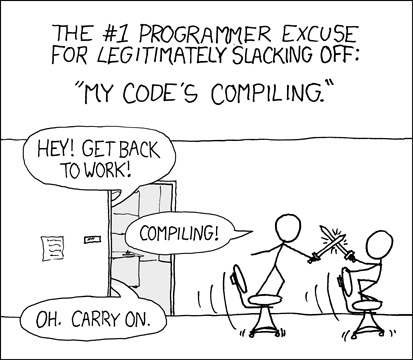 Ah yes, the wonderful part of writing code... and waiting an hour or more for it to compile. That is the fun part of my job, when I get to do whatever I want, and get away with it. Things are slow at the moment because a different team is compiling, but it's always fun to find little comics from the web and use them to keep me sane. I got this one from xkcd.com. They have an excellent collection of geeky comic strips that are just awesome!